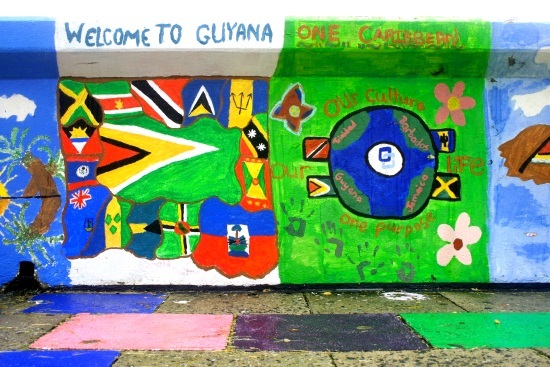 Cross some borders and you’d hardly know you’d switched countries. Roll across the 49th parallel from the US into Canada and you’ll soon spot a Walmart, a Safeway and a Pizza Hut. Switch from the Chilean side of Tierra del Fuego to Argentina’s half of the island and the winds blow with the same relentless fury. Pass between Kenya and Tanzania and the rice and beans still taste just as bland. 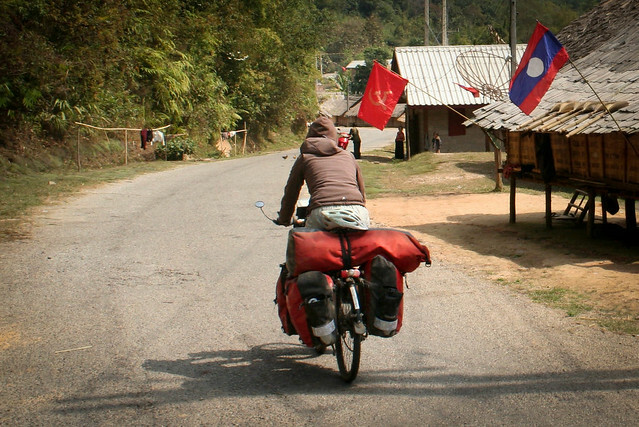 Roll across the border from Vietnam into Laos and you notice an immediate change of mood. The entire nation seems to be infected with a laidback sort of happiness and contentment. And what a knack for making a touring cyclist feel welcome…the Sawaidees and Hello’s hardly let up. Need a place to rest for the night? No problem, there’s room at the village health center, the primary school or, heck, why not just pitch your tent right here at my house and while you’re at it, come on in and join us for dinner. One of the Lao people’s favorite expressions is bow penh nyang —no problem. Want to snap my photo? Bow penh nyang! Like to fill up your water bottles? Bow penh nyang! 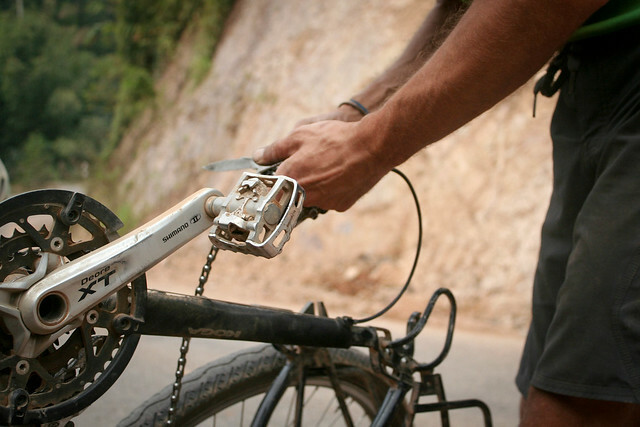 Need a lift because you’ve got a busted derailleur? Bow penh nyang! 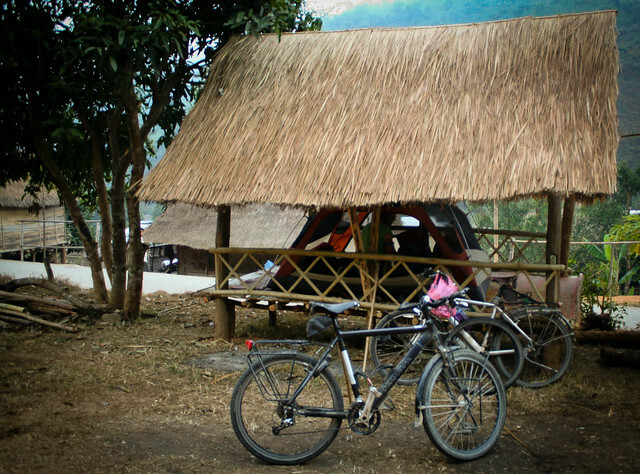 I never thought we'd end up camping in Laos! Where are all the guesthouses when you need them? 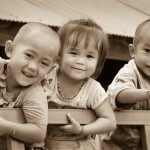 As you can imagine, with all this positive energy floating around, we’re feeling pretty good in Laos. Good enough to give ourselves a little extra challenge and explore some of the backroads of the land of a thousand elephants. While we’d heard Highway 13, the main road leading south of Vientaine, was a beautiful ride, we’d also heard talk of heavy traffic and hordes of two-wheeled tourists. 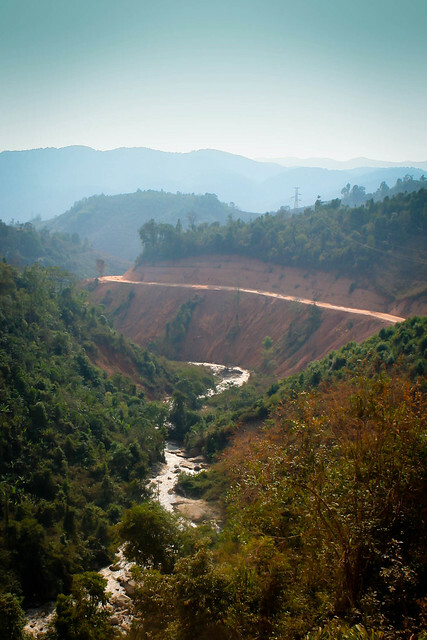 Wanting to see a less-visited side of Laos, we opted to turn off on Highway 1C towards Phou Loei National Park and then hop onto Highway 6 to Phonsavan. I won’t lie to you, the riding was tough, and more than once I questioned our decision not to stick to a more well-worn route. That was when I was grinding up one of the many 15%- 20% grade passes. The climbs were real killers, 20 kilometers up and then all the way down to around 500 meters before we’d climb again right back up to 1,500 meters or more. The down side of the passes was bliss. A sense of pure elation often overtook me as I sped downwards through the cool mist-covered tropical forest, not a vehicle in sight, nor a sign of human habitation. Of course that ecstasy was over in a matter of minutes and then it would be another couple of hours of hard slog back up the mountain. Fortunately the Hmong, who inhabit these remote parts of the country, are fond of building their villages on mountaintops. 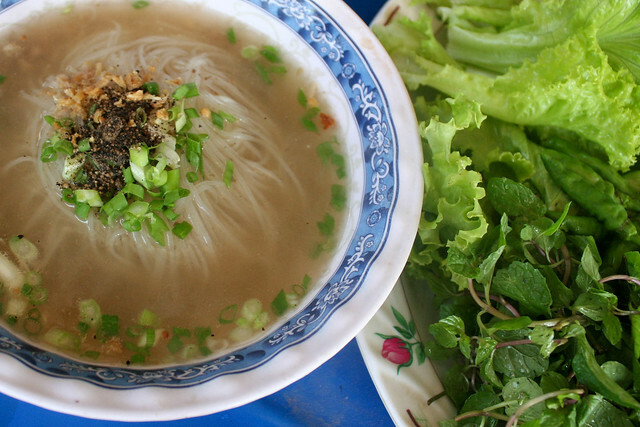 For hungry cyclists, that translates into a bowl of hot noodle soup waiting at the summit. Alright the noodle soup in the little shops at the top of the pass wasn't quite this tasty looking, but it filled us up. Pickings were pretty slim most days. 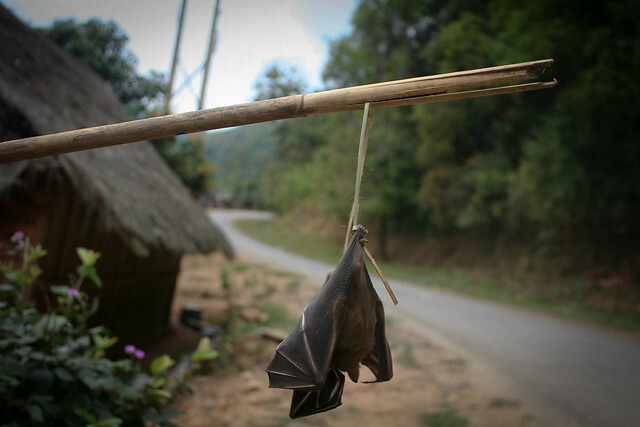 Bush meat—bats, rodents and small animals found scurrying around the forest—is a popular source of protein in much of Laos. Not too tempting for me! Apart from noodle soup, eggs and sticky rice were about the only tempting staples we could count on coming across. After a few days of skipping lunch and surviving on vast quantities of junk food imported from China, we took to stopping by the side of the road and whipping up some fried eggs when the hunger pangs could no longer be ignored. Villages were best avoided for our lunchtime feasts as our forays into cooking tended to attract large crowds. One day as we were setting up, a woman even brought some kindling assuming, I suppose, that we were going to start a fire. Locals in the highlands certainly don’t have the luxury of a gas cooker and for them it’s campfires day in and day out. Our multi-fuel stove was of great interest, as were our lightweight pots and pans. Locals never seemed to grow bored of gawking and I tried my best to ignore their stares and carry on eating. Not the best lunch I've ever indulged in, but fried eggs go down pretty good when you're REALLY hungry. Flat-fixing was also of great interest, and I’m pleased to report that we supplied free entertainment for gaggles of kids on far too many occasions. The bikes have been acting up. Flats galore (5 one day) and finally Eric’s derailleur decided to give out. We were stuck by the side of the road, but not for long. The first driver that saw us in distress pulled over and we were able to hitch a ride to the next village where a team of mechanics and passersby got the bike back into working condition in no time flat. Eric ended up fitting the bike with an old derailleur he'd been carting around since who know's when. Sometimes it's good to be married to a pack rat. The cool villages of the highlands are behind us now as we sweat it out in the town of Pakxsan on the banks of the Mekong. The last few days of riding from Phonsavan have been rough ones. No, not due to the hills, they’re far gentler further south. It’s the state of the road that’s posing a challenge. Some parts are smooth as silk, others, well….a work in progress. Rickety to say the least! Dry and dusty on this stretch of road...the highlands were so much more pleasant. The road south of Phonsavan, not quite finished! 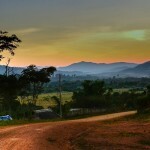 We’ll be sticking to Highway 13 south to Thakek for the next 250 kilometers before we break back onto the backroads and follow a quiet track along the Mekong towards Cambodia. Sure, off the main road we may not stumble across a comfortable guesthouse each night and sticking to the backroads could mean a return to fried eggs and rice. Bow penh nyang! Taking the path less pedaled always results in rewards. 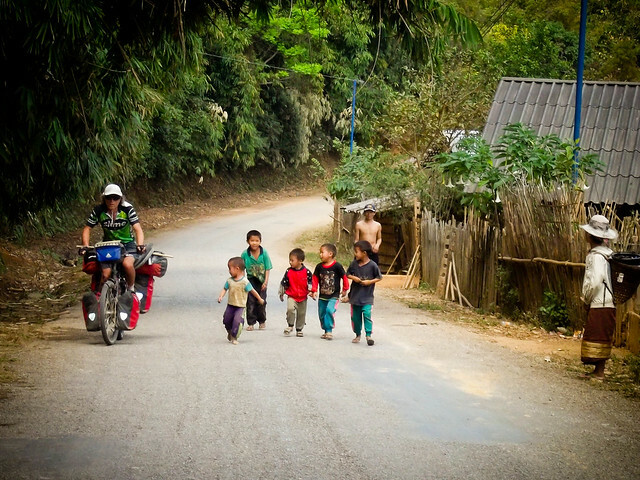 Chatting with locals, one of the very best reasons to hit the backroads. 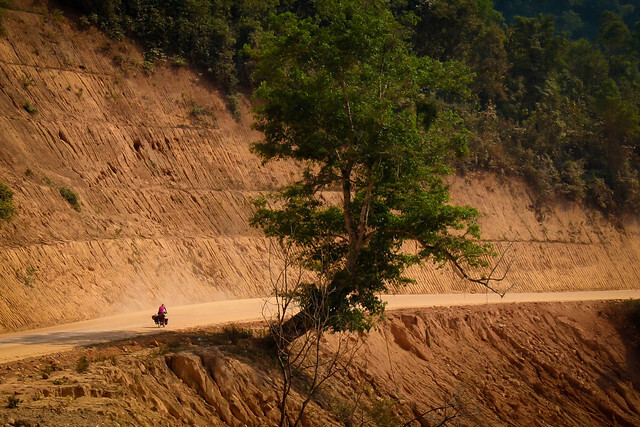 Check out more of our LAOS PHOTOS on FLickr. Show a little love and leave us a comment and let us know what you’re thinking. Where’s your sense of Adventure? 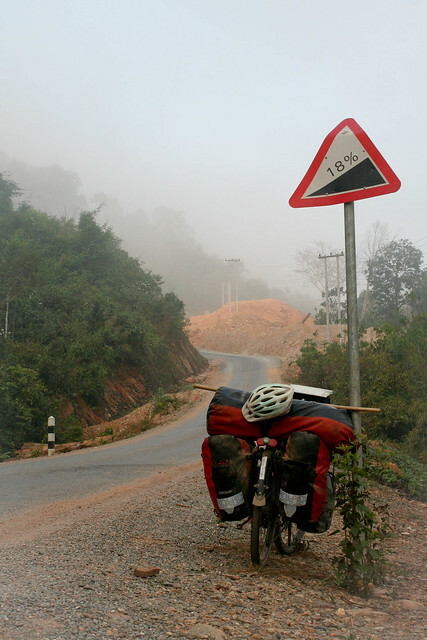 Laos sounds just wonderful…except for those 18% hills. I don’t know how you manage with those heavy bikes. And that bridge! Looks like it could collapse at any moment. Maybe you would have been better off wading across. That bridge really did frighten me, I though I’d plunge through at any moment but the current was too strong for wading and the river a tad too deep. Wonderful to see you are still on the road. 84 countries. thats amazing. not many people on the planet right at this moment can say that. infact i would bet there would only be a handful that can claim that. would be an interesting fact. maybe you are destined for the book of guinness. how ever you spell that. when finished here i am going to look it up. will let you know. keep peddling though just incase you have to get through some more. hee hee. one good thing for me in this blog you wrote. you say you are going to cycle every country. hope the uk hasnt been done yet as then we get a visit. i AM going to get that visit. hee hee. stay strong keep the spirits high. Record or not, we’re having fun with the challenge. We’ll tackle the UK in a couple of years after we hit Australia, the rest of Asia and bike back to Europe. 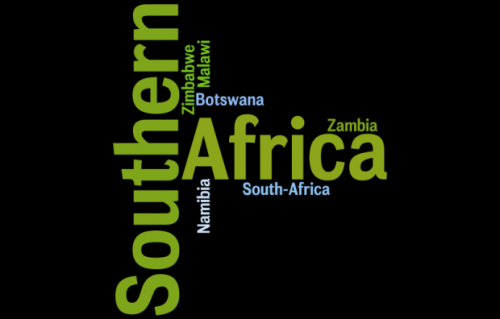 We’ll stop by and chat about old times in Africa. I often wondered about the derailleur after we ‘fixed’ it in our shop on Longbar. 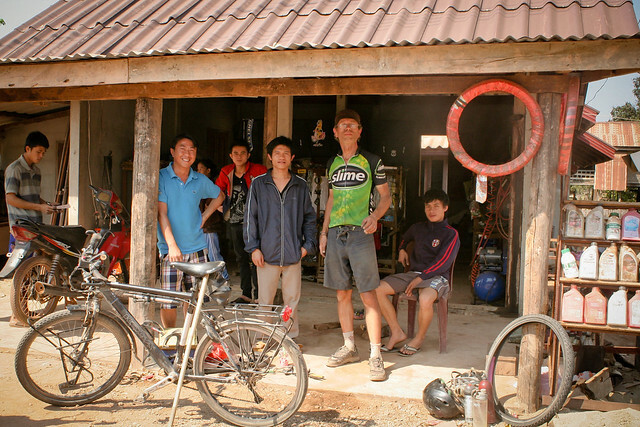 Glad to hear it’s ticking along again with the help of your new friends in Laos. Lovely to see you’re both well and meeting the challenges. Wow! Keep it up. Molly says hi. That was MY derailleur which made it to Hong Kong before we replaced it. This time is Eric’s bike which is giving us the trouble. May have to continue single-speeding it south till we can get a replacement derailleur hanger sent. A big hug to you and Heather! And for Molly a few extra tosses of the tennis ball. I’m gonna repeat myself:you have a geat site.Thanks for sharing your experience.Lots of infos and inspiration.Thanks again. So, so true! 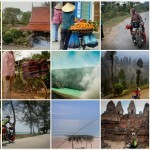 Backpackers mainly stick to the larger towns and are thus easy to avoid. 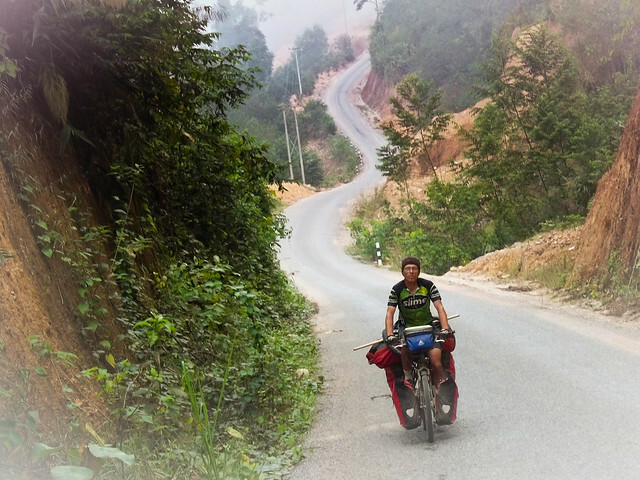 As for other cyclists, sure you can find them on highway 13 in Laos. 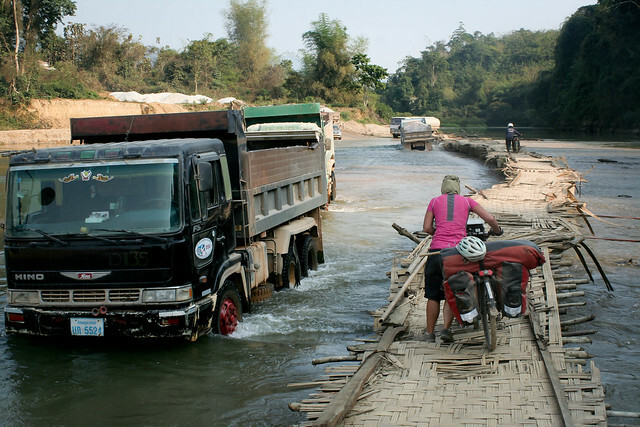 But outside of Laos – nearly everybody makes up their own route unless they’re on their way to Singapore.